Viburnum Tinus are beautiful dense evergreen shrubs that are popular for their multi-seasonal interest. These are excellent winter flowering plants that are easy to grow and maintain as well. French White Viburnum is a pretty variety that will keep your garden lively throughout the year with its stunning flowers in clusters and elegant foliage. Its ornamental shiny blue berries will create a significant impact in your garden in autumn. French White are compact shrubs that grow vigorously to a height of 3 metres. 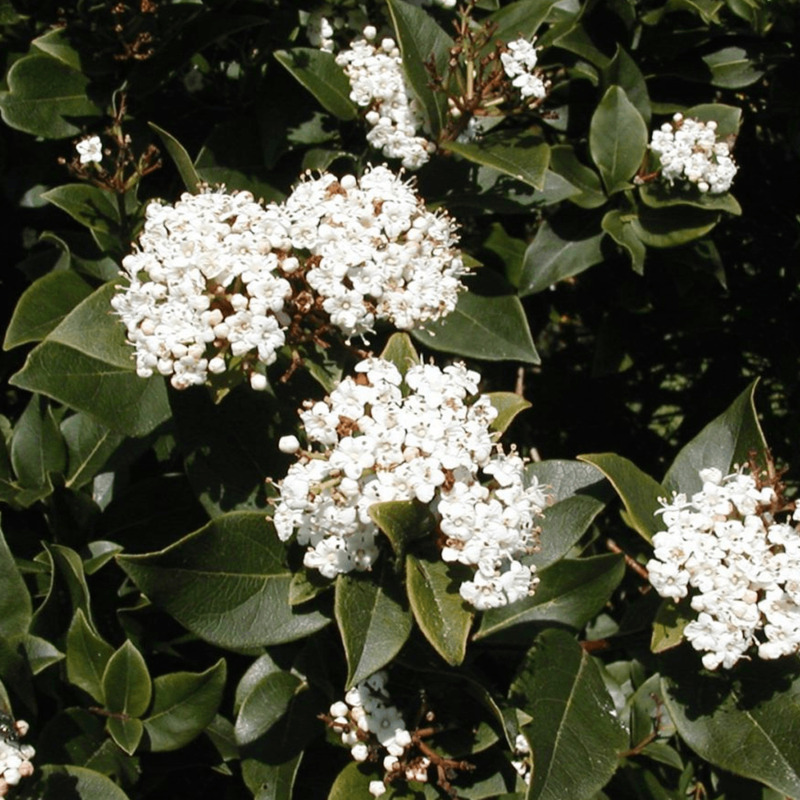 They produce flat cymes of small white flowers from December to March, making them great winter flowering shrubs. Their dark green ovate leaves are evergreen, adding a bright contrast in the garden for other plants all around the year. In summer, one can see clusters of blue berries growing that will attract wildlife to your garden. Plant French White Viburnum in full sun or partial shade, in a sheltered spot protected from cold dry winds. It will thrive in moist soil that is well-drained. Pruning it is easy, simply cut back longest shoots or trim to maintain its perfect round shape. These easy to grow hedging shrubs do not require ongoing maintenance. Water the young plant moderately until they establish and will be able to cope with some neglect afterwards. Look no further, if you are in search of a gorgeous flowering plant that is easy to maintain and will thrive all-round the year. Viburnum French White is the right choice for winter gardens, informal gardens and cottage gardens. Use them to decorate dull borders in groups and to provide bright contrast to other garden plants.